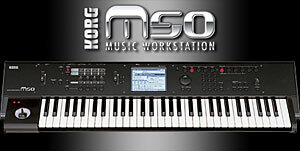 All pages that relate specifically to working with Korg M50 workstations are listed here. You may also click on the korg-m50 tag in the Tag Cloud to find all articles that have been tagged with korg-m50 that may not be directly contained in this category. To create a new page in this category, click Add new Korg M50 page in the side menu (after entering a title in the box). Note: Many of the M3 articles apply equally well to the M50 since they are very closely related, with the exception of built-in KARMA. (You can add KARMA to the M50 with the KARMA M50 Software.) Click on the korg-m50 tag in the tag cloud to the left to view all M3 articles that have been tagged for M50 as well.